Manola and Juri created Dolomit to provide international students with dynamic learning experiences. Our courses combine interactive classwork and outdoor educational activities in a cohesive program. Trentino’s wealth of resources will allow you to tackle issues of global concern, improve your communication skills in Italian, and foster your critical thinking. Welcome to Trentino, the butterfly-shaped province of Northeast Italy. Here, the predominance of mountains, the variety of climates, and the influence of the German culture fostered the development of distinctive identities. 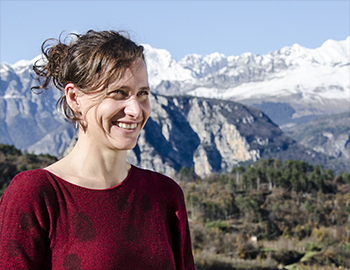 Today, Trentino is home to a vibrant community that honors this rich heritage and has undertaken its path to the future through innovative social and ecological practices. 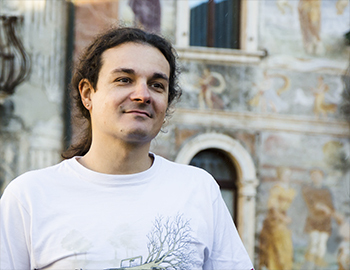 Juri and Manola spent half of their lives far from their home country, Italy. Thanks to an array of study, volunteer, and work experiences in Europe and the Americas, they learned the value of flexibility and open-mindedness. Through advanced training in the human sciences, they cultivated their analytical skills and deepened their awareness of past and present societies. Their irresistible curiosity and dedication to knowledge allowed them to appreciate the abundant diversity of the world. Now, Manola and Juri are looking forward to welcoming the world to their native country. I grew up with my nose pointed toward the tops of the mountains towering in front of my house. Those giants of rock had a immense impact on my imagination: I loved reading about myths and legends, I believed in the existence of gnomes, and I spent hours fantasizing about the wonderful places that lay beyond them, all ready to be discovered. Curiosity has been the mainspring that has driven me to explore the world. I began as a traveler, and I continued as a student of anthropology, a discipline that revolutionized my thinking and helped me to appreciate and respect the amazing diversity of the human being, across time and across space. I left a piece of myself in many countries, but the United States in particular played a pivotal role in shaping my worldview: here I had the privilege of deepening my interest in anthropology at a graduate level and working closely with students from all over the world as a teaching assistant. In all my travels, the compass that has always guided me was the thought of my mountains, whose call I could not resist. Here, surrounded by the giants of rock again, I wish to welcome students from all over the world, and rediscover my beloved land through their eyes. MAKES US REFLECT ON OUR IDENTITY"
I was born and raised in the historic district of Trento, the provincial capital of Trentino, surrounded by monuments and ancient constructions. The old building where my family resided up to my college years lies on the site of Trento's early medieval south gate. During my childhood, my grandparents were the unfailing source of memories of World War 2 and the following reconstruction. My passion for history and the decision to make it the fulcrum of my professional career certainly have a lot to do with such a meaningful heritage. My curiosity exceeded the landscape with which I was most familiar, and my home country as well. Before turning 17, I left Trento to spend half of my junior high school year in two Latin American countries, Honduras and Ecuador. Such a challenging but rewarding experience convinced me to couple a thorough training in the human sciences with a deeper knowledge of that fascinating area of the world, and to seek the best opportunities for doing so, regardless of national borders. As an undergraduate and graduate student, I took classes and did research in several institutions across Europe and the Americas. Meanwhile, as I gained experience lecturing on history, the humanities, and Italian in international settings, I discovered my vocation as a teacher and enjoyed the uniqueness of each group of students I had the good fortune to meet. I participated in the creation of Dolomit to bring out the immense potential of my beloved Trentino as a training ground for the global citizens of today and tomorrow. My ambition is to put my academic skills and international background at the service of whoever chooses to seize this special opportunity and join us in this distinctive Italian region. "LOOK AT THE WORLD WITH THE GLANCE OF THE OUTSIDER, BECOME FAMILIAR WITH THE UNEXPECTED: THIS IS WHAT MEANS TO INVESTIGATE THE PAST AND APPRECIATE A FOREIGN CULTURE"
"With Dolomit, we aim to challenge simplistic visions of social reality and to value cultural diversity, offering rewarding learning experiences to the curious"